Rodgers to give tough time to Mignolet as he eyes Ochoa Premier League side Liverpool are planning to seal the deal for Mexican stopper Guillermo Ochoa next month, according to the Express. Premier League side Liverpool are planning to seal the deal for Mexican stopper Guillermo Ochoa next month, according to the Express. 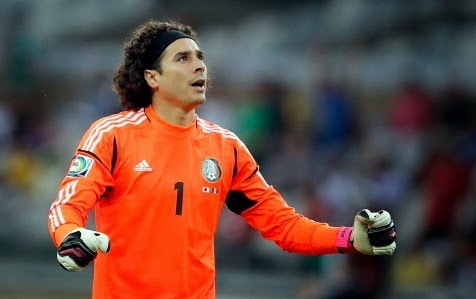 Ochoa impressed in the World Cup and got attention of many top sides including Arsenal. Now reports have revealed that Liverpool have made a £3million bid to secure the goalkeeper move. The 29-year-old who signed for Malaga in the summer has not even made any appearance in the La Liga. Malaga boss Javi Gracia has given the first team role to Carlos Kameni. There will be no blockage in this move as the player is useless for the club plus he wants to play regular football which he can get at Anfield if he performs well. Liverpool current Belgian keeper Simon Mignolet is yet to perform consistently. He was dropped in the last Premier League game against Manchester United and Brad Jones was given a chance who also failed to impress. With the arrival of Ochoa, Mignolet might become better with time as the Mexican has enough qualities to compete with him. But on the other side, Mignolet might lose his position for the remainder of the season if the Malaga stopper shines at Anfield. Mignolet, 26, has played 62 games for Liverpool since his move from Sunderland.